As GOP presidential hopeful Donald Trump is known to do, after he does an interview, he will retweet what his followers thought of the interview. Not surprisingly, most of the people he retweets don’t think very highly of the interviewer. 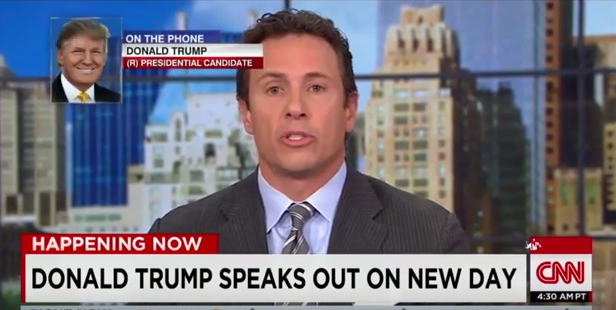 In today’s case, Trump went on New Day in the 7am hour and was interviewed (yet again) by anchor Chris Cuomo. Trump’s supporters, however, don’t like Cuomo. "@Karentalk: @CNNPolitics @realDonaldTrump Stop interrupting Trump..Please..He is CORRECT ON EVERYTHING.."
"@LindaRicker6: My choice @realDonaldTrump just finished a great interview on CNN. Pathetic questions from Cuomo but Trump cleared the air." "@Lisa_Steen: seriously Cuomo hates DonaldTrump he was a pathetic interviewer AS USUAL! Please don't go anywhere Mr Trump AMERICA NEEDS YOU"
"@WMikeWood: @cnn Trump Shuts down Cuomo. "I am not getting out." I am going to win. Cuomo tries sleazy tricks . Epic Fail. Unprofessional."